Hoorah! It's zombie-arse kicking time. 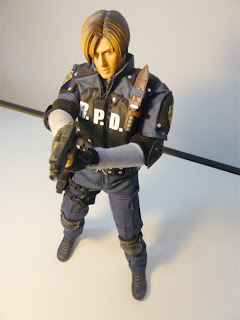 I picked up Hot Toys Leon Kennedy (R.P.D. version) from the good people at TFH today. And since my sister's camera is a little low on the res', I've borrowed my boyfriend's semi-pro camera. I hope you enjoy the photos - it's my first attempt doing a photo shoot of a 12" figure. I know the lighting's inadequate and too orangey, plus I need to work on better poses and composition. I'll take more photos and update after I've borrowed the camera charger - the batteries ran flat before I was done. I took off the first half-star because the figure was secured with six twisties, delaying Leon's emancipation from the box by a good 5 minutes. There are those circular pieces of sticky tape too, but these are easily removed without damaging the packaging. Package design is very simple on the front - all-black with an embossed "Biohazard 4" logo. Considering the flashier, metallic boxes for the popular Hot Toys Movie Masterpiece series, this is a lot less exciting (another half-star removed). Would have been great if they printed something similar to the game cover on the front to pay it proper homage. Lastly, Hot Toys has taken a leaf from Sideshow and used magnets for the front flap, which is a tad more sophisticated than velcro patches. Hot Toys, in my opinion, does the best job with paint. Human skin is a complex material to render in any medium, and I think they're the most successful at it. It might have to do with the colour of the plastic they're using for heads, but I'm not gonna test if it's their blend/layers of flesh-toned paint or the plastic itself. The only drawback here is the hair. I would have preferred a more subtle gradient. In photos it's hard to tell, but looking at the figure in-person the contrast looks a bit too much. Leon uses a Hot Toys True-Type base body, and therefore poses like a dream. 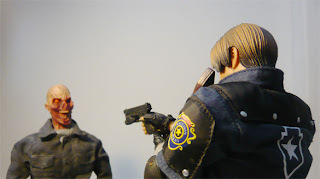 Since good articulation is currently a given with Hot Toys, let me mention that unlike their military series where most of the utilized bodies are the tanned-skin version, Leon's body matches the skin tone of his head. I wish they would sell these other lighter skin tone bodies (again). No complaints here, there is quite an arsenal for Leon! 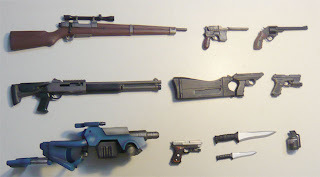 You get a total of 11 weapons (2 knives, 4 handguns, 1 magnum, 1 shotgun, 1 rifle, 1 flash grenade, 1 energy weapon). Under handguns, the basic handgun, Mathilda and Blacktail have a removable clip. The barrel on the Broken Butterfly Magnum can be flipped open, and its hammer is functional. Matilda and the very awesome-looking Plaga Removal Laser 412 (pictured above) are secret weapons from the game. He also comes with his communicator device, which flips open to reveal Hunnigan's and Leon's portraits. The display stand helpfully comes printed with the Biohazard 4 logo and Leon's name. Watched the Resident Evil movies? Here's your chance to have Leon star in his own movie, and out-gun and out-kung-fu Milla Jovovich. Also a great excuse to stockpile 12" zombies. There is quality and quantity here. Both versions of Leon are going at the official price of SG$200 locally. It's a high-end collectible, so only big fans of Hot Toys or Resident Evil need apply. The first shipment of Leons is fully pre-ordered at TFH, so if that's a good gauge of this figure's popularity it should retain or increase its value in time. Despite that, it's still pricey. I am sure many people can count themselves as fans after having watched the movies and/or played the video games. Hot Toys delivered this with utmost quality and integrity - picking Biohazard 4 as their very first Video Game Masterpiece. (It's not a movie tie-in, and Biohazard/Resident Evil 4 was inititally released in 2005.) 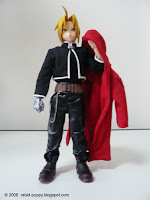 With enough support, Hot Toys might eventually pick up another quality game license like Silent Hill, or perhaps even compete with Medicom with Metal Gear Solid. In Singapore - you can head to The Falcon's Hangar @ Waterloo Centre for either Regular or R.P.D. 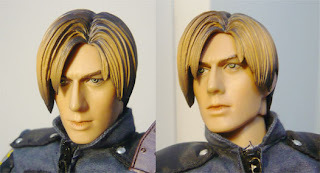 versions of Leon. They also sell both versions of Jack Krauser and the Ganado Chainsaw villager. Online: eBay. You can get it from several Hong Kong sellers at approximately SG$170 (US$119) before shipping. Stay tuned, I'll be posting photos of Leon taking on a *horde of zombies. love the sculpt, it's a beauty. 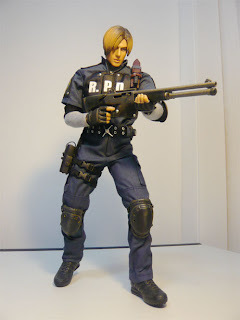 i didnt play RE4 so i cant justify getting this figure .... the contrast for the photo is right .... "hey man, nice shot"
Thanks Sket. 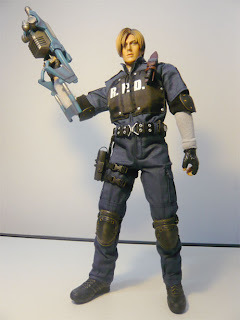 ^^ I'm not really a huge fan of RE4 (since picking up Silent Hill my RE interest has waned a bit), that's why I picked up the R.P.D version, which is his Raccoon Police Department uniform from RE2. Leon's first day on the job at the police department - and a zombie infestation breaks loose. Talk about a rough day. Wow thanks for the great write up. 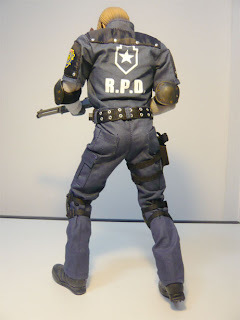 *__* Leon is hawt as ever, but I think many people are getting the RE2 version. I wanna see the RE4 version with the typewriter too. I wonder if he comes with as many accessories. 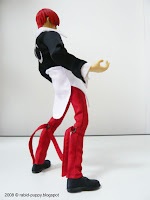 hey mizu, no way, the more blogs bout our fave sixth scale figs the better! hey wanna trade links? thanks for the great review, it convinced me to pull the trigger! Awwshucks! I'm glad you found the review useful, Harry. Now I recommend you add some zombies so Leon doesn't feel lonely, haha. It's one of the best bloggers. I've been following his works since the first entry done and I really like his articles.